Click here to know more about fixed deposit rates and schemes. Invest in Fixed Deposit and earn upto 9.1% as returns. Based on a comparison of FD rates of all banks, DCB Bank offers the highest FD rate of 8.25% for deposits with a tenure of 36 months. FD rates of banks are determined by changes in RBI monetary policy such as repo rate, base rate etc, internal liquidity position of banks, economic conditions and the level of credit demand. FD interest rates of different banks in India vary by deposit amount, deposit tenure and type of depositor. If you compare fixed deposit rates of NBFCs and HFCs in the table above, DHFL offers the best FD rate of 9.25% for deposits with a tenure of 36 months. FD rates of NBFCs and HFCs are higher than the bank FD rates which are risk free deposits. The risk on FDs of NBFCs and HFCs correspond to the credit ratings assigned to these deposit schemes. At the bank FD rates in 2019, top banks for 1 year FDs are IndusInd Bank, RBL Bank as they offer highest interest rate of 8.00 on regular term deposits. If you want to open a 3 year FD, IDFC Bank, IDFC First Bank are the best banks as they offer a higher rate of 8.25 on 3 year Fixed Deposits compared to other banks. For 5 year FDs, HDFC Bank, ICICI Bank should be your top choice as their rate of interest is maximum at 7.25. Bank FD is a risk free investment and best FD rate of 9.25% offers moderate returns enough to cover inflation rate. As a depositor, you need to be careful before choosing FDs of non banks, as unlike bank FDs, these FDs carry market and credit risk. The level of risk with non bank FDs is reflected in the level of credit ratings assigned to the FDs of NBFCs and HFCs. Bank FDs being risk free, are not required to get a credit ratings done and also offer slightly lower interest rates than that of FDs of non banks. Rate of Interest on bank FDs vary by the amount of deposits, tenure of deposits and type of depositor. Deposit Amount: Banks offer lower interest rate on bulk deposits of more than Rs 1 crore and high interest rate on deposits of less than Rs 1 crore. Depositor Type: All banks in India offer higher interest on senior citizens FDs. Currently, the interest rate on senior citizens FDs ranges from 3.50% to 9.75% depending on the deposit amount and deposit tenure. A fixed deposit (FD) is a type of deposit account provided by banks for a fixed tenure at a fixed rate of interest. In this scheme, the depositor keeps a fixed amount of money in an account known as FD account. The money is deposited only once at the time of account opening. At the end of the tenure, the interest amount is calculated on the principal amount and the total sum including interest is paid back to the depositor cumulatively. Fixed account earn higher interest rates than a regular savings bank account. Can be opened by all residents, including minors and HUFs. Allows choosing 2 nominees in application form eligible to receive the FD amount after the death of the holder by submitting a valid death proof. Does not allow to withdraw deposit amount before maturity. Hence, encourages a depositor to save. Premature withdrawals from FD is allowed in emergencies by paying penalty. Banks also offer Sweep-in facility on term deposits which allows the depositor to interlink their savings bank account to fixed deposit account. 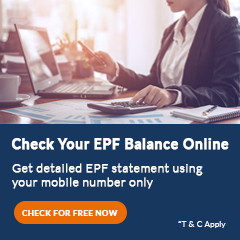 This unique facility on FD facilitates the automatic transfer of surplus funds from savings account to FD account thus allowing you to earn FD rates on your savings with an option to break the FD anytime and use the amount for your expenses. 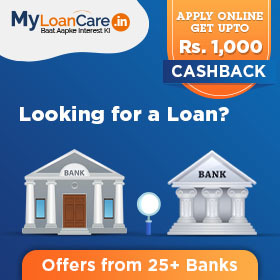 You can also avail loans on your fixed deposits to meet any financial emergency. In loan against FD, your deposit is the security for the loan. Depending upon the bank, you would get a loan on your FD up to the extent of 75-95% of the FD amount which varies from one lender to another. Rate of interest on FD loans are 1%-1.5% higher than your FD rate. Interest offered on senior citizen FDs is slightly 0.25% to 0.75% higher than that offered to other individuals. Senior citizens are required to submit their age proof to avail the benefits of senior citizen FDs. FD Interest Rates for senior citizens are higher than regular FD rates and range from 3.50% to 9.75%. Tenure on senior citizens FD is between 1 day to 10 years in most of the banks. 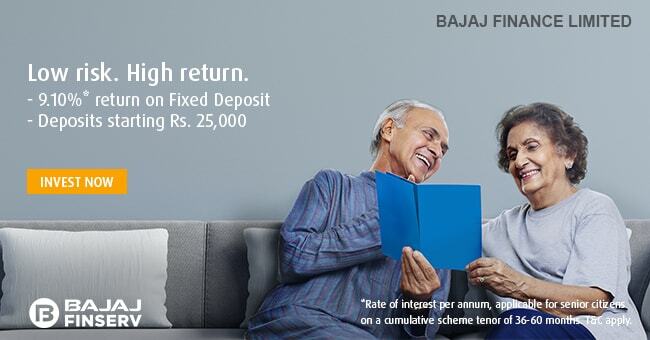 Senior citizens FDs earn 0.25% to 0.75% higher interest compared to regular deposit rates. Timely closure of a FD means closing your FD at the time of its maturity date. While closing your FD upon its original maturity, the bank will pay you back the principal amount along with the interest on your deposit. Breaking a fixed deposit account means withdrawing the entire sum of money before its maturity. This is allowed from time to time and the withdrawal rules may vary from one bank to another. Banks usually levy a penalty at the time of breaking your FD account or pre closing it before attaining the original maturity and it pays you back the principal and interest either at a lower interest rate or after deducting a penalty on your FD. However, some banks including IDFC Bank, Yes Bank and Bank of Maharashtra waive off interest penalty on FD if the liquidation is due to some emergency. Partial withdrawal allows you to withdraw a certain amount of money from your fixed deposit account either to fund emergency or to take advantage of higher rate of interest which is offered by some other bank at the same time. It is generally allowed in units of Rs. 1,000 and a penalty of 1% is levied by the banks and the remaining balance amount which is lying in your fixed deposit account continues to earn the original rate of interest. Most of the banks allow the facility of part withdrawal with some penalty and there are few banks which do not allow to withdraw any amount during the deposit tenure. Carefully evaluate and compare factors such as maturity, interest, penalty for breaking FD before maturity before choosing the fixed deposit and FD bank. Also, understand the broad macro-economic factors and expected trends in interest rates. If you expect the interest rates to go up in the near future, opt for a shorter tenure FD to keep your options open of investing when interest rates go up. If you expect the interest rates to go down in the near future, you can decide to opt for a longer tenure FD with a high interest rate. Before parking your surplus amount into a fixed deposit account, depositors should also check and compare the tenure wise interest rate offered on FD. In some cases, banks offer a higher rate of interest on FD held for a shorter tenure than on the FD kept for a longer time period. Similarly, it is not essential that higher interest rates correspond with longer tenure. Banks may offer higher interest rate on some select tenure to manage their internal liquidity position. Last, but not the least. Carefully plan all your expenses and create a FD only for an amount that you believe you will not require for a minimum period of time. Suppose, if you have surplus money Rs. 100,000 but you have a home loan repayment of Rs. 50,000 scheduled after two months. In this case, it is advisable that you deposit Rs. 50,000 in a short-term FD of less than 2 months and the remaining Rs. 50,000 in to a long tenure FD. Interest on FD is taxed at marginal tax rate applicable to the depositor. Hence, for a person in top most tax bracket, the post tax return on a FD that earns 9% interest may work out to just 6%. One point that lot of depositors are unaware of the fact that interest income on FD’s is taxed on accrual basis. To explain this further, let's take the example of a cumulative fixed deposit of Rs. 100,000 placed at 10% for 5 years on 1st April 2015. The maturity value of this FD will be Rs. 163,862 taking into account quarterly compounding. The first year interest accrued on this FD comes to Rs. 10,381. However, the depositor will not receive any Still, the depositor must pay tax on the accrued interest in the year 2015-16 in the assessment year 2016-17. In case the interest earned by you on fixed deposits with all branches of a bank in a year exceeds Rs. 10,000, your interest income will be subject to 10.3% tax deduction at source (TDS). Remember to quote your IT PAN when opening the term deposit, as otherwise the bank will need to deduct twice the tax at 20.6%. Also, you can claim credit for TDS only if your PAN is recorded with the bank. These deposits are made for a fixed time period with the bank and it allows you to earn a high rate of interest on your deposit amount depending on the tenure of FD. The FD interest rate is as offered by the bank at the time of deposit. What are the documents required for opening FD? Is the rate of interest on FD for senior citizens higher than regular fixed deposit? Yes, senior citizens get higher rates between 0.25 and 0.75 per cent interest rates on their FD. You can open a fixed deposit account for minimum 1 day and maximum up to 10 years although it may vary from bank to bank. As per Income Tax Act, 1961 under section 194A when the interest earned on FD in a financial year exceeds Rs. 10,000, TDS is applicable on the credited interest. A depositor may also furnish Form 15G/15H to avail exemption from paying tax on his interest income. Who are eligible to invest in FD schemes? The following are eligible to invest in FD schemes- Resident Individuals, HUFs, NRIs, Firms, and Charitable Trusts while others can apply for the scheme by submitting an offline application. Does investment made into term deposits provide any benefits? Yes, investing in term deposits provides many benefits including a fixed rate return on your FD investment, flexibility to withdraw the FD at any time before its maturity. Besides this, an individual can also avail loans up to the amount invested in the FD along with the overdraft facility from the bank against the FDs. Can I redeem my fixed deposits before the original term? Yes, an FD can be closed before its original term. If the FD is closed before completing the original term of the deposit, the interest will be paid as per the interest rate applicable on the date of deposit for the period it has remained with the bank. However, some banks may also levy a penalty prescribed by them on the date of deposit. When can I renew my FD? The person may renew his/her FD on maturity by submitting a duly filled FD Application Form 15 days prior to the date of maturity along with the old FD receipt with revenue stamp of requisite value on it. However, your FD renewal will be subjected to the terms and conditions of the FD scheme as applicable on the maturity date of the old deposit. Can I take loan against fixed deposits? Yes, many lenders provide the facility to take loans against fixed deposits. The bank generally provides loan on your FD up to the extent of 75-95% depending upon the lender and loan tenure. Usually, loan against FDs are quick and cheap loans available to meet financial emergencies. Can I opt for an auto renewal facility while opening a FD? Yes, you can opt for an auto renewal facility at the time of opening the FD account prior to its maturity. Auto renewal facility allows your FD to get renewed automatically for the same period as the original deposit. However, under the auto renewal option the time deposit receipt is with the bank’s custody and Memorandum of Deposit (MOD) is issued in lieu of fixed deposit receipt. Why does Fixed Deposit rate fluctuate? The fixed deposit interest rate fluctuates due to changes in the prevailing macroeconomic conditions. The various factors responsible for the change in fixed deposit interest rate include a higher rate of inflation, liquidity condition and demand and supply conditions.